Do you have a small bump on the bottom of your tailbone? It may be a pilonidal cyst, and while the name may be unnerving, there is no need for concern. It is important to treat the pilonidal cyst to prevent infection and relieve any discomfort or pain it may be causing you. We will learn more about these annoying cysts before discussing pilonidal cyst home treatments. You can distinguish a pilonidal cyst as it will be a tiny sac located at the top of the crease of the buttocks. This cyst will first develop as a depression in the skin and can be barely noticeable. As it fills with hair and debris from the overlying skin, an abscess is formed and can become infected. Why such a cyst forms has yet to be determined. The indentation that forms into the cyst may become filled with an ingrown hair or suffer trauma and present an area for the collection of dead skins cells, dirt, and debris. Many people would rather treat a pilonidal cyst in the privacy and comfort of their own home. We have collected the top 10 commonly used pilonidal cyst natural remedies. By using a heated pad or warmed cloth, you may be able to speed up the healing process by promoting drainage of the cyst and relieving any pain and discomfort. Simply place a warm compress on the pilonidal cyst for several minutes. Repeat this treatment three or four times each day. Tea tree oil has antifungal, antibacterial, and anti-inflammatory properties to destroy the infection. It is one of the most common pilonidal cyst home remedies. Combine one part of tea tree oil with 10 parts of water. Soak a cotton swab in the mixture and place it on the cyst. Rinse after 10 minutes and repeat the treatment two or three times each day. Reduce inflammation and relieve pain with the components in apple cider vinegar. It has anti-inflammatory, antibacterial, and antiseptic properties. Combine two or three teaspoons of organic raw vinegar and half a cup of warm water for a healing solution. Soak a cotton ball in the solution and apply it directly onto the cyst for one minute. Repeat three or four times each day. You may also want to drink this remedy by adding one teaspoon of apple cider vinegar to warm water. As a powerful pilonidal cyst natural treatment, the properties of Epsom salt can target the pain and inflammation. The magnesium sulfate content will promote drainage of the pus. Dissolve one tablespoon of Epsom salt in one or two cups of warm water. Using a cotton swab soaked in the water, apply it on the cyst for a 20- to 30-minute treatment. Repeat once each day. You can also add one cup of Epsom salt for every six inches of water in a tub for a relaxing bath. This is another good anti-inflammatory and pain-relieving remedy for pilonidal cysts. Use a cotton ball and heated castor oil as a temporary treatment directly on the cyst and hold with a bandage. Replace the cotton ball two or three times each day. Garlic has natural antibiotic and antifungal components to target infections and boost the immune system. Simply place crushed garlic directly on the cyst and cover. Rinse after a few minutes and repeat once each day. Consuming a few cloves of garlic followed by drinking water can also aid in the healing process. Soothe a sore cyst with the antibacterial and anti-inflammatory properties of aloe vera gel. Apply the gel directly on the pilonidal cyst for a 15- to 20-minute treatment. Rinse and repeat three or four times each day. Another option may be soaking a cotton ball in the fresh gel of an aloe vera plant for at least five minutes. Place the gel on the cyst for 30 minutes. Repeat after two hours. Turmeric has the powerful anti-inflammatory property of curcumin along with an antiseptic component to target infections. Combine one tablespoon of turmeric powder and water for a paste to be used on the cyst. Once dry, rinse and repeat two or three times each day. You may also want to add one teaspoon to a glass of milk and drink daily. The acidity in black tea may help to reduce the cyst as it combats inflammation and pain. Just soak a black tea bag for five minutes in warm water before placing it on the cyst. After five to 10 minutes, remove and repeat with new tea bags three times each day. Prevent infection with the use of neem and its antibacterial and antiseptic properties. 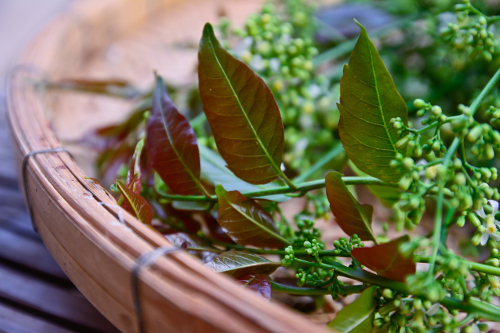 Use a handful of neem leaves and grind into a paste to place directly on the cyst. Rinse after 20 minutes. Repeat three or four times each day. To prevent the recurrence of pilonidal cysts, maintain proper hygiene, thoroughly wipe the area after using the washroom, and always pat dry. Limit sitting for prolonged periods and maintain a healthy weight to avoid skin folds in this area. Pilonidal cysts can be a painful and embarrassing nuisance. They can be the result of collected debris in the tiny natural curve above the buttocks. Most times, these cysts pose no health risks as long as they do not become infected. Your lifestyle, gender, and family history may dictate whether you develop a pilonidal cyst. If this type of cyst happens to develop, there are various natural home remedies to treat it and help prevent a recurrence. Cunha, J.P., “Pilonidal Cyst,” MedicineNet; http://www.medicinenet.com/pilonidal_cyst/article.htm#pilonidal_cyst_facts, last accessed June 29, 2017. “Home Remedies for Pilonidal Cysts,” Top 10 Home Remedies; http://www.top10homeremedies.com/home-remedies/home-remedies-pilonidal-cysts.html, last accessed June 29, 2017.